On Friday, October 8th, the ComReal Miami Industrial Team and their clients were given the opportunity for a private tour of the Port of Miami and learn more about Miami sea freight cargo and several major construction projects.The three main projects are the FEC railroad, the 50′ deep dredge and the Port of Miami Tunnel. Exciting news is that the Miami port was just awarded the grant of $22,000,000 which will be used to renovate the rail service between the Port of Miami and the Florida East Coast railroad. This rail will transport freight to the rail yard in Hialeah and then on to the national rail system. Since Miami, South Florida is at the southern end of the Florida peninsula, it is important that sea freight cargo and freight have access to the national rail system to take further north. This has been a project masterminded by the Florida Department of Transportation and the Florida East Coast Railway. Miami’s industrial real estate market and economy is going to change Post Panamax by 2014. You can read more about this by reading: “Miami warehouses Post Panamax“. 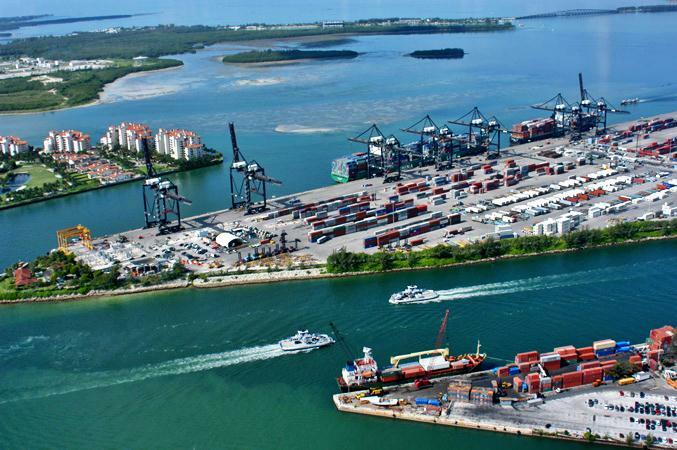 The Port of Miami Director, Bill Johnson, is attempting to successfully lobby for $75,000,000 of federal funding to deepen the channel to 50′ which would allow the large ships to access the Miami port. This is known as the deep dredge. Most of our customers and officials we speak with believe that this has a very high probabilty of happening and making the “deep dredge a reality”. You can visit the Port of Miami website at www.miamidade.gov/portofmiami/cargo.asp. To learn more, visit the Port of Miami tunnel at www.portofmiamitunnel.com. 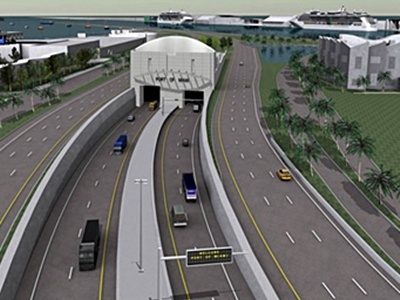 The third project that is now well underway is the Port of Miami Tunnel. Most Miamian’s know that the Port of Miami is on an island, Dodge Island. So getting the cargo off the island as soon as possible to make room is of vital importance. The new tunnel is being constructed from Dodge Island then underneath Biscayne Bay which will then lead to I-95 and I-395 highways. The Director balances between the dual-purpose port which is known both as the “Cruise Capital of the World” and the “Cargo Gateway of the Americas”.